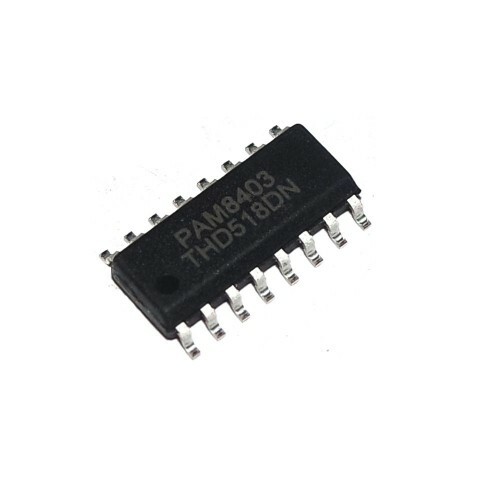 Buy online PAM8403 Audio Amplifier IC in India at low price from DNA Technology. Now make you own audio amplifier using this PAM8403 IC. PAM8403 is a 3 Watt, class-D audio amplifier. It offers low THD+N, allowing it to achieve high-quality sound reproduction. The new filterless architecture allows the device to drive the speaker directly, requiring no low-pass output filters, thus saving system cost and PCB area. With the same numbers of external components, the efficiency of the PAM8403 is much better than that of Class-AB cousins. It can extend the battery life, which makes it well-suited for portable applications. The PAM8403 is available in SOP-16 package. PAM8403 - Stereo Audio Amplifier ModuleThis Audio Amplifier Module is based on PAM8403 which i..